When writing a blog post, creating an emailing campaign, posting on social media, the rule No. 1 is always to pay a particular attention to the headline or title. This is a requirement if you want your content to be read. A press release is no exception to the rule. 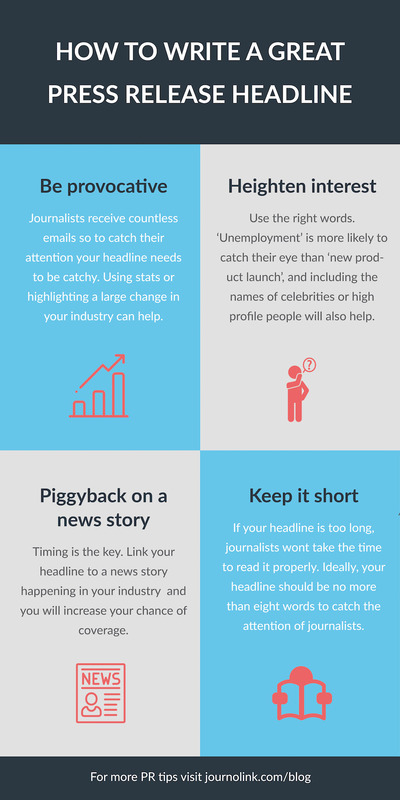 Read this infographic on how to improve the open rate of your press release headline. When writing a press release, you should always write the headline at the end as it is the most important thing you should focus on. Once your content is written, it is always easier to get a good idea of what's going to work better. That's how you improve the open rate of your press release headline. Did you find this infographic helpful? Please share it on your social media. If you would like to hear more of our business tips or would like more information about how you can get more media coverage for your business, sign up to our newsletter here. Julie has recently joined the team, and has a background in marketing and PR.